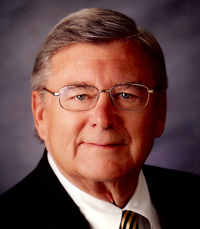 Karl Bick died peacefully at home on Aug. 7, 2014, surrounded by his loving family. Karl was born in Chicago, Ill., on Feb. 27, 1937, to John Casper and Helen Maher Bick. In 1940, the Bick family moved to Barrington, Ill., and where Karl graduated from both St. Anne’s Grade School and Barrington High School. After high school, Karl spent four memorable years at the University of Notre Dame, graduating with a degree in Economics followed by two years at Northwestern University, graduating with a master’s degree in Business Administration. Karl married Susan Eiden in September 1964, where they then returned to Chicago and he worked with Arthur Andersen & Co. In 1969, following a ski trip to Colorado, Karl joined the Snowmass at Aspen Resort as financial vice-president of their real estate development, construction and sales operations. After a chance encounter of meeting Bill Janss, Karl and his family moved to Idaho with an opportunity to be on the development team for the Elkhorn Resort, which was part of the Sun Valley Resort portfolio. In 1984, Karl went into real estate brokerage. In 1988, with his then-wife, and friend to the end, Fern Mackenzie, partnered with other longtime Sun Valley realtors, formed Bick, Norris, Sampson, MacKenzie & Co. This evolved into Associated Brokers of Sun Valley, which was sold to Sotheby’s International Realty in 2005. Karl retired from Sotheby’s in 2009 and moved to Boise. Karl’s love of the Sun Valley area grew profoundly, expressing itself in his involvement on the Sun Valley City Council, Sun Valley Center for the Arts, Blaine County Planning & Zoning Commission and the governing board of the Moritz Community Hospital as it merged with the old Blaine County Hospital and evolved into the newly built St. Luke’s Wood River Hospital. In addition, Karl loved his time biking, skiing and golfing in Sun Valley’s gorgeous environment. On his move to Boise, Karl remained active in community activities, especially in St. Mary’s parish, where, in addition to church, he assisted in the operation of St. Mary’s Food Bank and as a member of the St. Mary’s School governing board. Karl is survived by his children, Kirsten, Jayne (Daniel Gehrung) and Andrew; his sister, Katherine (Chris) Merritt and their children, William and James (Letisha); and brother-in-law Alfredo Abeyta and his children, David (Dorothy) with grandchild, Owen, and Kathy, with grandchildren Emily, Nathan and Kennedy Clare. Karl was preceded in death by his parents, John and Helen Bick, and his sister Clare Abeyta. Karl and his family offer their most sincere thanks for his care to St. Luke’s and MSTI; Dr. Greg Thompson, M.D., Dr. Paul Montgomery, M.D., and his nurse Cathy, and to the staff of Legacy Home Care, especially to Matt, our on-call nurse, for his compassion and humanity during this time. A Mass in Karl’s memory will be held on Wednesday, Aug. 13, 2014, at 1 p.m. at St. Mary’s Church, 2612 State St. in Boise. A celebration of life will be held in Blaine County at a later date. In lieu of flowers, donations may be made to St. Mary’s School Scholarship program, 2620 W. State St., Boise, Idaho 83702.